NASA's Mars rover Curiosity has consumed its first samples from inside a Martian rock in order to analyze the chemistry and mineralogy of the Red Planet. The Curiosity rover deposited the powder-like samples, drilled from the interior of the Mars rock "John Klein," into two onboard laboratories so they could be studied in detail, rover mission scientists said in a statement Monday (Feb. 25). 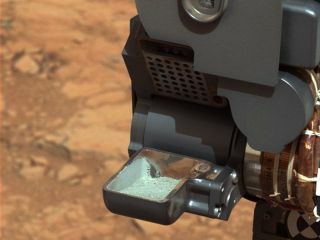 The left Mast Camera (Mastcam) on NASA's Mars rover Curiosity took this image of Curiosity's sample-processing and delivery tool just after the tool delivered a portion of powdered rock into the rover's Sample Analysis at Mars (SAM) instrument. The delivery to SAM and subsequent repositioning of CHIMRA to present this side toward Mastcam, were on Sol 196 (Feb. 23, 2013). Curiosity's first Mars rock samples were placed inside the Chemistry and Mineralogy (or CheMin) instrument, as well as the rover's Sample Analysis at Mars instrument during a two-day operation on Friday and Saturday (Feb. 22 and 23). "Data from the instruments have confirmed the deliveries," said Curiosity Mission Manager Jennifer Trosper of NASA's Jet Propulsion Laboratory (JPL), Pasadena, Calif. The small Mars laboratories are built into the body of the car-size Curiosity rover. They are two of 10 instruments built to determine if Mars is now, or ever has been, capable of supporting microbial life. Curiosity used a percussive drill mounted on its robotic arm to dig into the Mars rock John Klein on Feb. 8, revealing a surprisingly gray-colored interior of the rock. The discovery is intriguing to Mars scientists because it suggests that the rusty reddish-orange color of Mars is only skin deep. At the center of this image from NASA's Curiosity rover is the hole in a rock called "John Klein" where the rover conducted its first sample drilling on Mars. The drilling took place on Feb. 8, 2013, or Sol 182, Curiosity's 182nd Martian day of operations. The gray-colored rock powder "may preserve some indication of what iron was doing in these samples without the effect of some later oxidative process that would've rusted the rocks into this orange color that is sort of typical of Mars," Joel Hurowitz, sampling system scientist for Curiosity at JPL, told reporters on Wednesday (Feb. 20). NASA's $2.5 billion Mars rover Curiosity landed on the Red Planet on Aug. 5 to begin a two-year primary mission to study its landing site, the vast Gale Crater. The rover is currently studying the John Klein rock target as a pit stop on the way to a destination called Glenelg, which is near the base of a mountain that rises up 3 miles (5 kilometers) from the center of Gale Crater.